1. 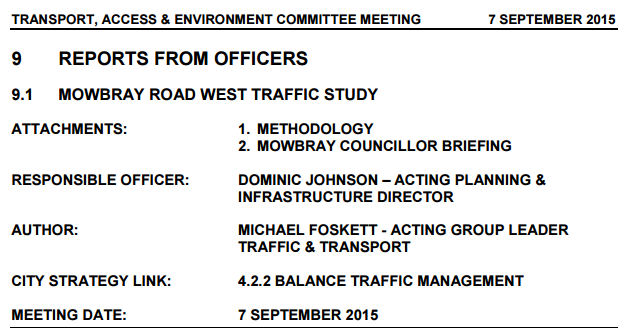 Endorses the Mowbray Road West Traffic Study Addendum Report, with the exception of items 4a and 5. 3. Advises Lane Cove Council that Willoughby City Council gives qualified support to the recommendations made in the SMEC Study along the lines of the commentary in this report. 4. Provides Lane Cove Council with a copy of the PeopleTrans study and advised of the additional recommendations made in that report regarding Felton Avenue, Dalrymple Avenue and Pacific Highway and their support requested for the implementation of those measures. At the Transport Committee Meeting on the 7th September 2015 there was general consensus among the community and Councilors to adopt the Officer’s Recommendations. I have good news to report. The revised traffic report went to the traffic committee a week ago, where the committee unanimously adopted the council officers’ recommendations. Last night, at the full council meeting, the minutes of the traffic committee meeting were approved, which makes it official. Well done to everyone who showed up in support of the matter at the committee meeting on the 7th. We had a great showing with over 100 people in the gallery, and the message was overwhelmingly one in support of the recommendations– especially in support of fixing the Beaconsfield lights. Many of you spoke and spoke well, and it made a big impression on the councillors, culminating in the adoption of the recommendations. Do not underestimate how much impact this had—everyone did a fantastic job. Even if you didn’t speak, your attendance made a big difference and underscored the high level of support in the community for coming up with a workable solution to our traffic problems. You can download the traffic committee minutes here (www.willoughby.nsw.gov.au/DownloadDocument.ashx?DocumentID=11444), which contain the specific details of what was adopted. 1. The Beaconsfield lights are to be fixed to allow both a right turn and a through movement into Ralston. 2. A dedicated right turn from eastbound Mowbray into southbound Centennial in Lane Cove will be added. This is already planned to be funded by Lane Cove Council in the 2016/17 financial year, but our mayor has agreed to meet with Lane Cove to try to speed this up. 3. A traffic light is to be installed at Mowbray and Hatfield, planned for this financial year. 4. Traffic calming is to be installed in Dalrymple and Coolaroo. This will probably require another community feedback phase, but council are aware of the time pressure to make these streets safer, so it should hopefully be expedited as much as possible. 5. Adjustments to no stopping areas are to be made on Mowbray to allow traffic to better flow around right turners (you can see the details in the report) as well as some enhanced signage to improve safety. 6. Some adjustments to signage, parking restrictions, enhanced lighting, and vegetation clearing on both ends of Coolaroo are to be made to improve line of sight and safety (details in the report). 7. Council will lobby the RMS on fixing the Mowbray / Pacific Highway intersection, which is a cause of a lot of problems. This is a long term thing, but it needs to be addressed. Of note, the proposals around the partial or total blocking off of Coolaroo were not adopted, so the intent is to keep Coolaroo open with the hope that the other changes will bring volumes and speeds back into an acceptable range. The battle now shifts to holding the council’s feet to the fire on all of this, so please don’t be shy in communicating with them to express your support of what they’ve decided and your excitement that it will all be done as quickly as possible. I will keep you all appraised of developments and timelines as I become aware of them. I want to thank you all for your support and encouragement—job well done to all.